(LOS ANGELES, CA.) In a previous blog posting, I reported on the growing movement of undocumented youth seeking to assert their rightful place in U.S. society. I was reporting on the advent of an entirely new political subject involving the expression of “undocumented fearlessness” among youth without papers who deliberately had themselves arrested protesting SB1070 against the backdrop of the struggle to end the reign of Sheriff Arpaio and his constant dragnets in the Latina/o community, which are designed to fill the shoddy tents in his desert gulag with the fresh money-making bodies of detainees who are eventually swallowed up by the hidden holds of the private corporate prison and detention industry; these are the same forces that, with the Koch Brothers, are funding the attack on American democracy. 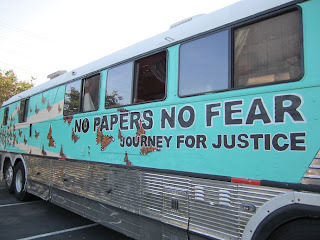 This amazing and energetic movement includes many youth who were first brought to the United States as infants and older minors; they are the constituency targeted by President Obama’s recent Executive Order temporarily suspending deportation proceedings against these innocent undocumented children and younger adults.